This week, InterExchange participants attended a WNBA game at Madison Square Garden. 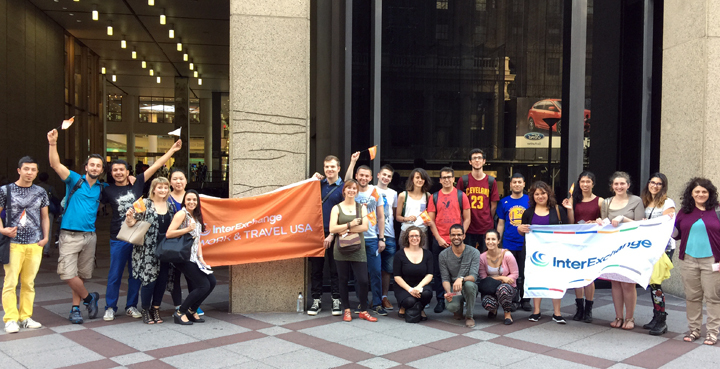 Everyone gathered at the main entrance around our orange Work & Travel USA flag for check in. Participants were amazed at how big Madison Square Garden was and took lots of pictures, excited to be attending an event at this famous venue. We watched the New York Liberty take on Indiana Fever. Everyone was excited and quickly took part in cheering on the New York City home team with the crowd, yelling "DEFENSE" and "LETS GO LIBERTY." Our participants loved the halftime dance performances and even won t-shirts and balloons that were thrown into the crowd! It was a close call, but the New York Liberty team won, leaving InterExchange participants proud and happy after an intense game. The WNBA game was a new, interesting and culturally immersive experience. Taking part in watching one of America's most popular sports was rewarding and truly a success!